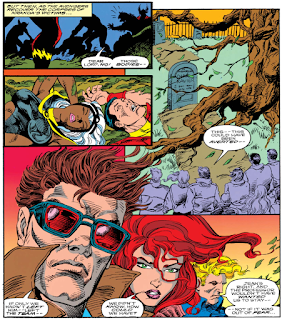 Later, as Warren Worthington expresses his happiness for Scott & Jean, the Watcher observes a reality in which Jean fell in love with Warren, not Scott, upon joining the X-Men, which leads to an increasingly isolated and bitter Cyclops to leave the team and fall in with Magneto's Brotherhood of Evil Mutants. Finally, as Jubilee laments the absence of Wolverine at the wedding, the Watcher watches a reality in which the Phoenix, in the form of Jean Grey, falls in love with Wolverine. But without the calming influence & abiding love of Cyclops, it grows out of control, and, unwilling to sacrifice itself, eventually consumes the universe. As the wedding of Scott & Jean concludes, the Watcher admits he doesn't know what the future holds for them, but whatever it is, he'll be...watching. What If? is Marvel's "alternate reality" series, in which each issue presents a different "what if?" 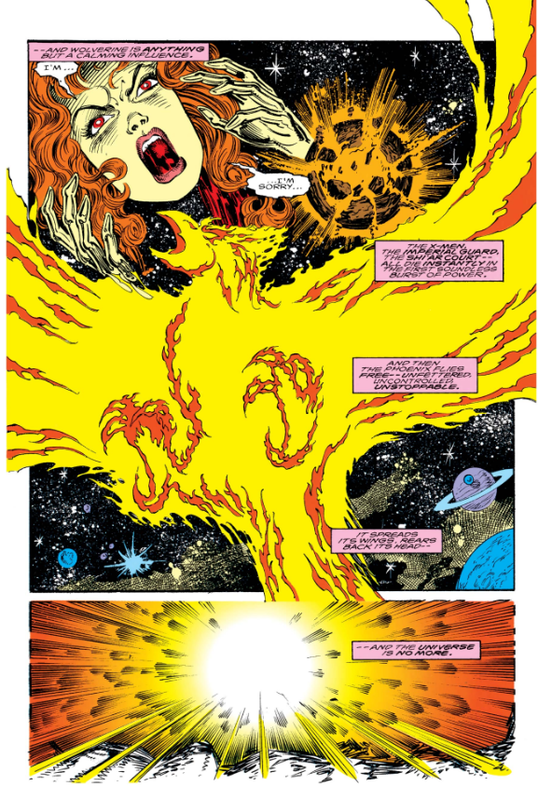 scenario culled from Marvel's past, such as "What if Phoenix hadn't died?" or "What if Spider-Man joined the Fantastic Four? ", and then explores the answer to the question posed in the title in the course of the story. The main throughline for all these stories is the Watcher, the alien being tasked with keeping an eye on Earth's development, who presents each story as a glimpse into an alternate reality created at the divergence point in question. In theory, the series presented fascinating looks at paths not taken and alternate story ideas, in the process altering, somewhat, our understanding of the original stories/scenarios. In practice, the vast majority of What If? stories answer the question inherent to the title with either "after a few different twists & turns, everything turns out mostly the same as in the "main" reality" or "everyone dies". This issue is actually part of the second volume of What If? ; the first started in the late seventies and ran into the mid 80s, and was, generally, more concept-driven, asking questions like "What if the Avengers had never formed?" or "What if Captain America became president?" This second volume launched in 1989 and ran until 1998 (the concept has been revived periodically since then, usually in short-run or "five week month" situations), and is much more storyline-focused, asking things like "what if the X-Men lost Inferno" or "what if the Avengers lost Operation: Galactic Storm" alongside the more concept/character based scenarios. 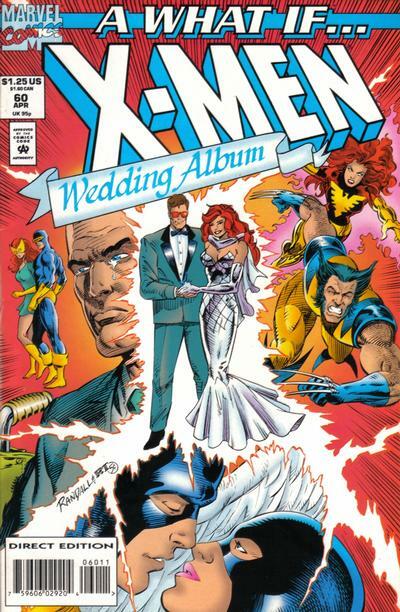 This particular issue is styled as a special wedding album, tying in to the Cyclops/Jean Grey wedding, and presents three alternate scenarios: what if Cyclops & Jean married earlier (circa the team's post-Silver Age, pre-All New reprint era), what if Jean fell in love with Angel instead of Cyclops, and what if Phoenix chose Wolverine over Cyclops. In true What If? fashion, the first and third scenarios end with large chunks of characters dead (the entire universe, in the case of the last story). Generally speaking, I've never reviewed issues of What If? before, despite a decent number featuring alternate X-Men scenarios, because they are, by definition, not part of the overall X-narrative, and have no bearing on the ongoing development of the characters, their internal universe, and the X-books as a publishing entity (which are the things I'm chiefly concerned with). I'm breaking that trend with this issue, in part because it features a framing sequence set in the main "616" reality, showing some additional scenes of the wedding not featured in X-Men #30 (including the X-Men greeting arriving guests), but also because it's the first issue of What If? I ever bought, specifically because of its tie-in to the wedding (from here, I would go on to buy additional X-Men-related issues of What If? until the end of this volume). I'm not planning on reviewing any additional What If? issues, but if people are interested, I could certainly consider past and future X-centric issues as possible Retro X-aminations/fill-in fodder when I need to make a last minute change. Kurt Busiek, in the process of becoming a household name on the success of Marvels (this issue was on sale between issues #3 and #4 of that series) writes this issue, which is notable in part because he's the fan who gave John Byrne the idea for the loophole which allowed him to bring Jean Grey back from the dead, creating the notion that Phoenix was a wholly separate entity from Jean. And with this issue, he writes an abbreviated, alternate version of the "Dark Phoenix Saga", with the full acknowledgement that the Phoenix therein is just a copy of Jean, the very idea he brought about as a fan. 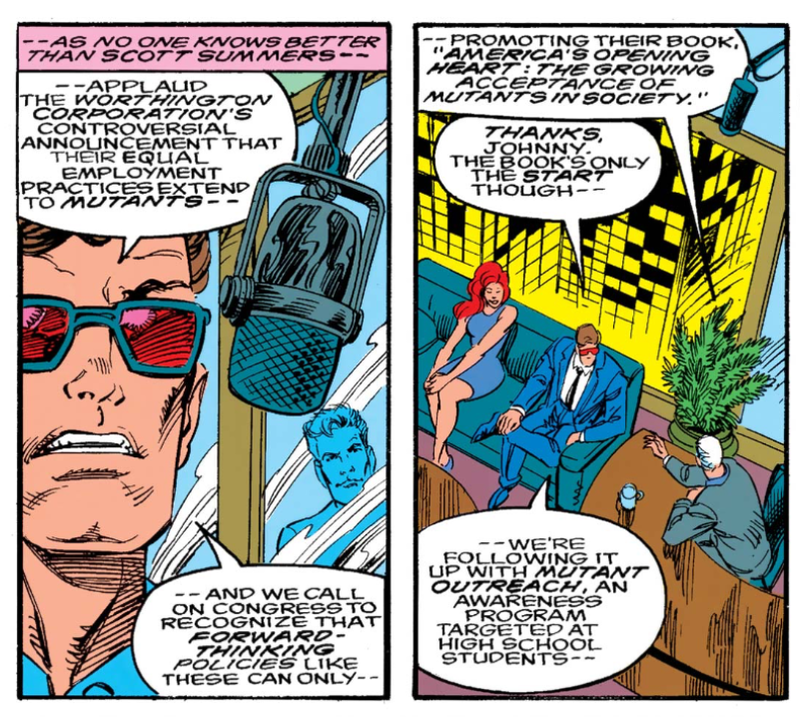 The first story references Cyclops and Marvel Girl's brief jobs as a radio DJ & fashion model, from X-Men #48, as they depart the school to live civilian lives. After they leave, Angel is appointed the new deputy leader of the X-Men. Eventually, Professor X recruits a new team of X-Men, this one including Northstar, Aurora (of Alpha Flight) and Catseye (of the Hellions), though I'm not sure how the original X-Men leaving early in this reality led to Professor X finding Catseye before the White Queen (butterfly effect, I suppose). And, of course, in the end, that entire team of X-Men, including Professor X, is killed by Krakoa. 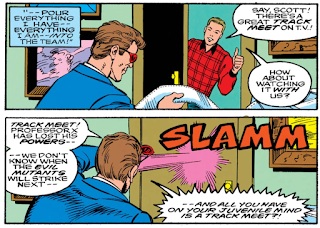 The second story presents an alternate look at the first dozen or so issues of the series, in which Cyclops gets increasingly pissed off at everyone (the result of Jean immediately becoming smitten with Angel instead of him), including his inability to enjoy that weird televised track meet Toad used to trap the X-Men in issue #5. He is also later much more (justifiably) angry when Xavier reveals his whole "I was faking the loss of my powers to test you!" ruse. 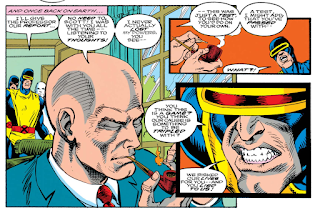 In this reality, Beast is named deputy leader when Xavier leaves to seek out Lucifer, which is the straw that leads to Cyclops quitting outright. 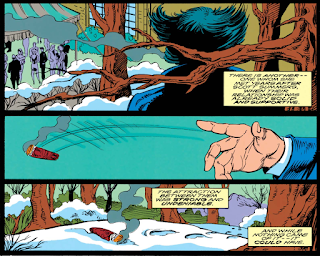 This leads to him falling in with the Brotherhood of Evil Mutants, which is where the story ends. 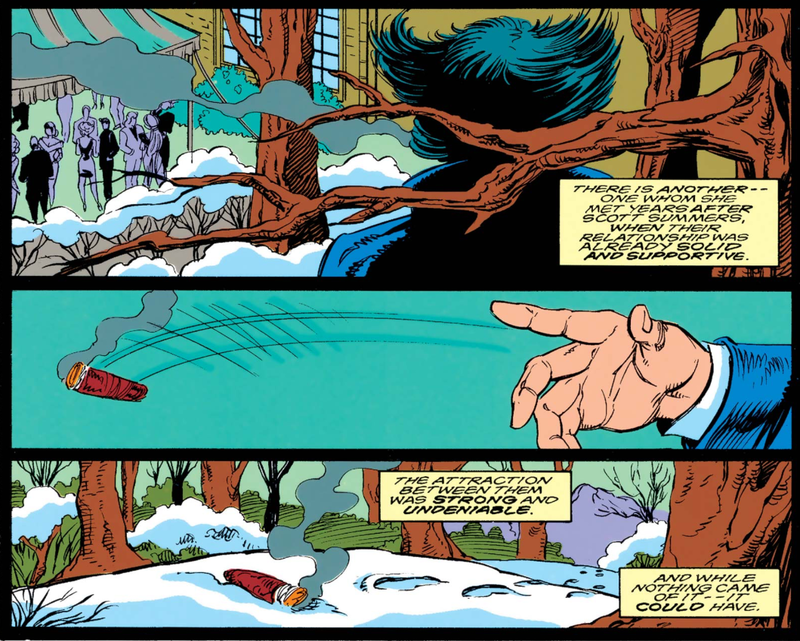 Hinted at in X-Men #30, this issue confirms that Wolverine was on the grounds, out-of-sight, for the wedding. 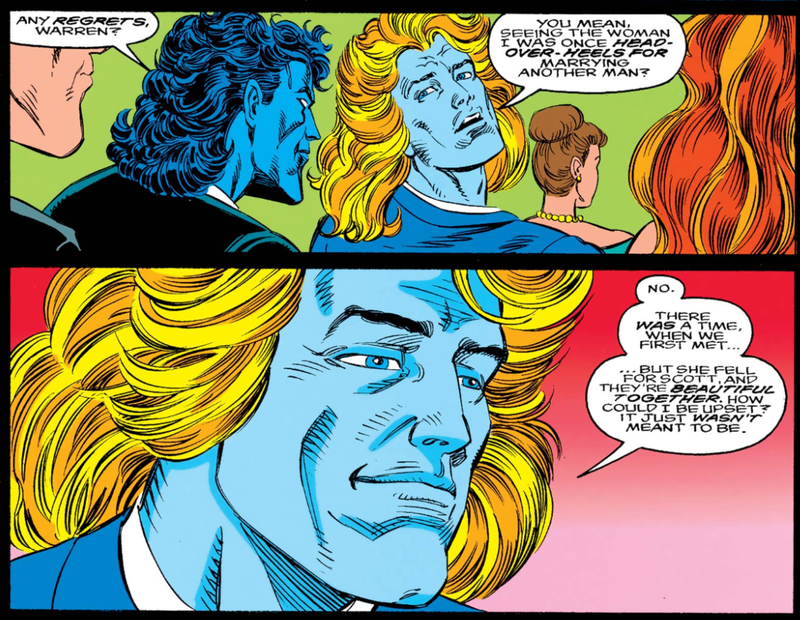 In another 616-framing scene, Archangel affirms that he's a-ok with Cyclops & Jean getting married, despite being the third leg of a love triangle with them for much of the series' earliest issues. In the third story, Phoenix gives in to her temptations for Wolverine, which ultimately leads to the entire universe being destroyed when their bond (and Wolverine's temperament) isn't enough to convince the entity to sacrifice itself at the end of "The Dark Phoenix Saga". 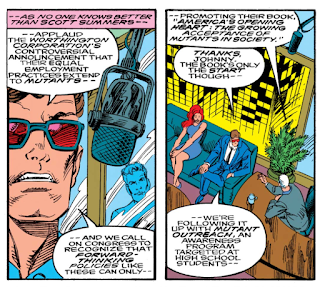 The first story suggests that with the original X-Men leaving Xavier's school sooner (following Beast, Cyclops & Marvel Girl's example), human/mutant relations improve, with the graduated X-Men acting as ambassador's of Xavier's philosophy in a context outside of superhero battles. One of the big flaws in the various What If? series (aside from the frequent repetition in the ways the central question gets answered) is that one issue's worth of pages are often not enough to fully flesh out the alternate scenario and fully explore its ramifications. That flaw certainly isn't helped here by this issue presenting three alternate scenarios, such that the middle one ends just as it's really getting interesting (with Cyclops throwing in with Magneto), and is never really about Jean picking Angel over Cyclops (she does, and then the rest of the story is just Cyclops spinning out as a result), while the third one is basically just a brief summation of "The Dark Phoenix Saga" with a worse ending. That leaves the first story as the sole standout, one which manages to present an alternate scenario that is both better (the fully graduated and independent X-Men seem to genuinely improve human/mutant relations) and worse (Professor X and the alternate New X-Men all die on Krakoa) than the "main" reality. All of that said, this is an entirely harmless and fun way to celebrate Cyclops and Jean's wedding. 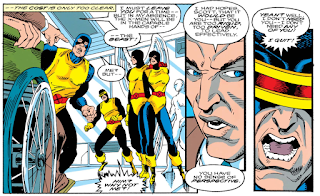 The art is nothing great, but Busiek comes up with some fun twists, and his focus on the X-Men's Silver Age (setting two of the three stories in that era) is appreciated (as is the fact that the "Jean ends up with Wolverine" alteration turns out to be the one that leads to the destruction of all existence). It can't quite overcome the inherent limitations of the series', and this particular issue's, format, but is otherwise perfectly fine as these things go. Next week, "Child's Play" concludes in New Warriors #45 and Cable teams up with the Acolytes in Cable #10. I've collected several What-Ifs from that error and I never cared for the "everyone dies" ones, especially since we all know that's not how it would actually go if actually published as canon. That said, I did like the end of the one when alll the X-Men died with Karkoa, which leads to a team where Charley and Beast lead a team of X-Men with Namorita, Wolfsbane, Siryn, and Warpath at the end. Wolverine replacing Dracula was another fun What If. The best What If may have been the two-parter when Spidey never married MJ, which ends up with Peter having relations with Silver Sable. I really like that the New X-Men of the Krakoa segment are a mishmash. The different Aurora & Northstar costumes are cool too. It’s the sort of thing — one among several, at least — that I found so neat about parallel timelines / alternate realities as a kid. Why those characters are there but not Wolverine, Nightcrawler, etc. is, like you say about Catseye, down to the butterfly effect, although I think Catseye being a Hellion when we meet her in standard continuity should mean she's too young to be here. Thunderbird would probably have fouled things up even worse, sadly, although Banshee could’ve helped in the maturity department. BTW, I dropped about a dozen comments Monday, all of which but one went to moderation because of lateness. Speaking of Retro X-Men Reviews, I have a possibility for you. The Incredible Hulk Annual #7 from 1978, guest-starring Iceman and The Angel, was co-plotted and penciled by John Byrne early in his X-Men tenure — in collaboration with Roger Stern, new X-Men editor as the issue hit the stands. I know you didn’t and don’t plan to cover the Champions stuff but the annual has just that pair and is the story where we find out Steven Lang survived by merging with Master Mold. I had this thought too, and almost wrote it into the review, but ended up passing on it because with the sliding timescale, I really have no idea how much time passed between the launch of the All New team and New Mutants. If it's just, like, two years (which seems ridiculous, but, sliding timeline), then I suppose it's not outside the realm of possibility that Catseye could be a Kitty Pryde-ish member of the New X-Men in this reality (or maybe she's older in this reality, because butterflies). Thanks for the heads up. Usually I get email notifications about that, but Blogger email notifications on comments and new posts has been down since the end of May (due, apparently, to some new digital privacy law going into effect in the EU). So I've been manually checking for comments every few days, but hadn't thought to check for ones awaiting moderation. Oh yeah, I have that one on my list for future Retro reviews. 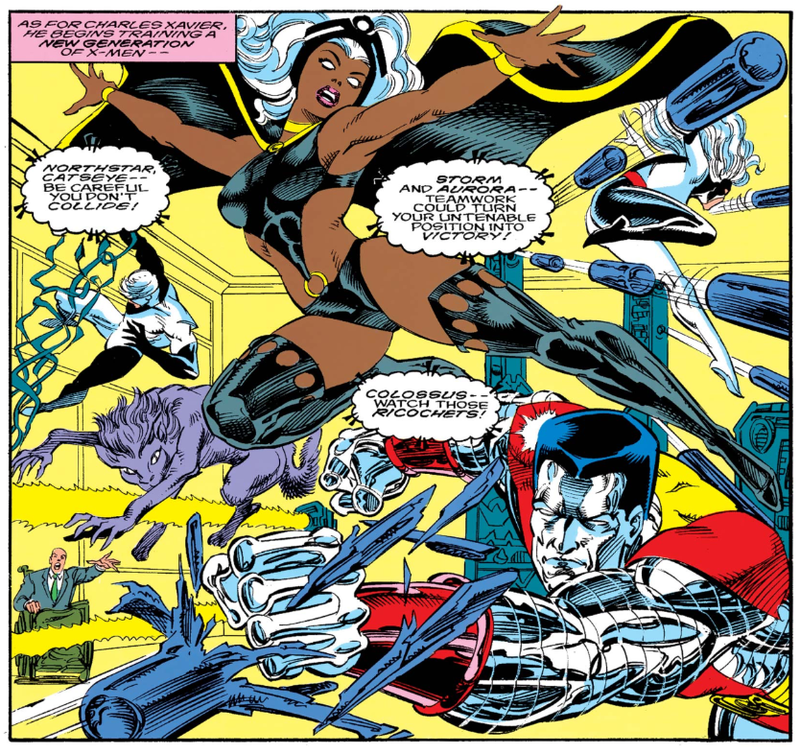 Basically, if John Byrne is drawing some X-Men and I haven't covered it, I'd like to. And, as you say, that story ties in with that Master Mold X-FACTOR story I really enjoy. They published for us as a black&white subscriber bonus gift the previous issue #59, where Wolverine didn't sneakily board the plane in UXM #121 and the X-Men turned their plane back to Canada and were shot down and killed. So Wolverine joins the Alpha-Flight and the Dark Phoenix Saga gets sanitizedly solved in a couple of pages in the end. It all felt like an exercise in futility for me. My reading of WHAT IF? is far from comprehensive, but from what I have read, I feel like that sentence could sum up the vast majority of the stories therein. What If almost always wound up just going with "it doesn't count, so kill everyone, usually in horrible ways"-a highlight being a What If that had Rick Jones exposed to gamma rays in the bomb test that created the Hulk, which created a bond between him and the Hulk and wound up with Rick, Iron Man, the Thing, the Human Torch, and the Hulk dead...and none of it really coming as a consequence of the "what if." Which was a big problem with the lazier ones, as the high concept just served as an excuse to have a nihilistic blood bath. The obvious story from exposing Rick Jones to gamma rays is HE becomes the Hulk, not triggering a bloodbath that basically ends the Marvel Universe in its cradle. The story in this where Xavier and the new X-Men die seems to be cast from that mould. What I'm saying is, What If was never really that good, and I have no idea how it lasted as long as it did. There are so many good early What If's. The Spider-Man one mentioned is great. 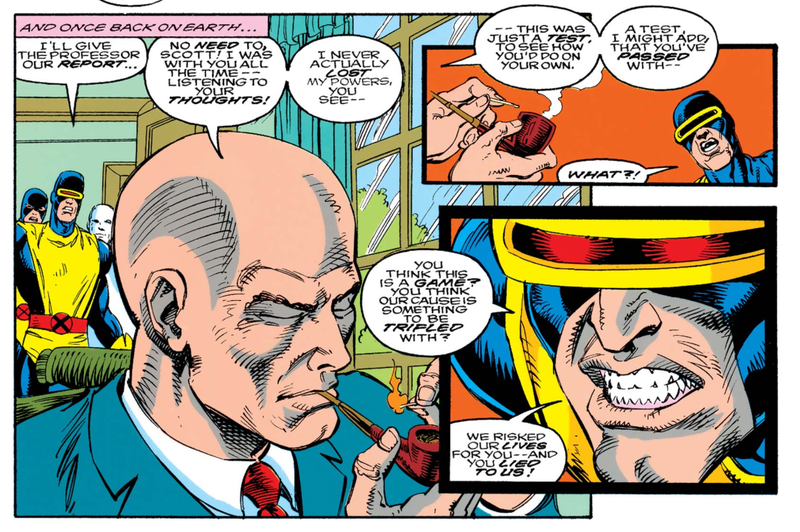 There is a 2 parter staring the Phoenix where Jean became a smoker and that really threw me off as a kid. The Inferno issue and then Wolverine becoming the Lord of the Vampires after Inferno is so good. There are a few based on the Age of Apocalypse and then issue 75 is Rogue and Gambit based on the Antartica storyline. Given the tendency for What If... to go for the bleakest possible ending, it's almost impressive the "Cyclops quits & joins the Brotherhood" story doesn't end with him slaughtering everyone. Big fan of this site, new commenter. I did want to mention one story that sticks out: #37 had a short story about "What If the Thing kept on Mutating? ", and it stands out for being the happiest ending in the history of What If? (that I'd ever encountered): the Thing gets cured, Alicia gains her sight, Bill Foster gets to join the Fantastic Four as a replacement and be the hero he wanted...I remember finding the whole story quite refreshing. (the very next story ended with the Beast devolving to an animal and living with Ka-Zar in the Savage Land, so the feel-good vibes didn't last). 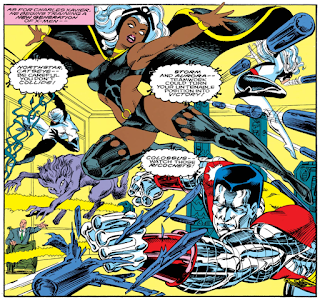 The first dozen issues of What If? loom large in my personal Golden Age of Comics. I broke my complete run after that — maybe the quality dropped off, maybe a too-familiar dystopic (or at least "darker timeline") pattern set in, but for sure I was less interested as a kid in characters like Nick Fury, Conan, and Shang-Chi than I was in full-on costumed superheroes like Spider-Man and the Avengers. There are several moments throughout that first run, though, particularly early on, that stay with me as cool, freaky, or funny to this day.